Russian soldiers discovered this disturbing alien creature along the Sakhalin shoreline, which is located in the most eastern part of Russia, some 5,000 miles away from Moscow and very near Japan. The rivers in this area are alive with fish of all kinds, particularly salmon. The coast of Sakhalin is also the only known feeding ground for the critically-endangered species, the Western Pacific Gray Whale. Other whale species on the verge of extinction are also known to gravitate to this specific area. These include: the North Pacific Right Whale, the Bowhead Whale and the Beluga Whale. What does this creature look like? So far, Russian scientists have not been able to either identify this anomaly or place it within the known order of anything at all. They do know that according to the bones and teeth, it is not a fish. Its skeleton also indicates that it is not a crocodile or alligator, even though the tail is suggestive of such. Oddly, it has a skin with hair or fur. 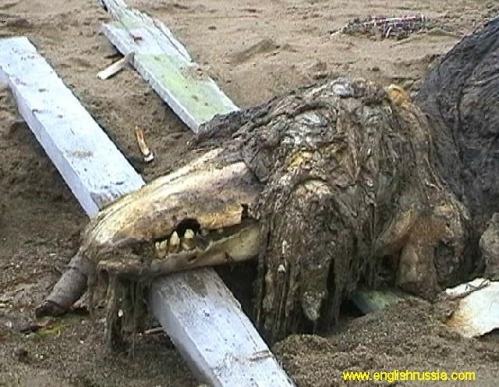 The very first people who encountered the remains of the mysterious alien creature took pictures as it lay on the beach. Soon after, Russian Special Services removed it and sent it away for further, in-depth study. What can the world learn from this extraordinary find? I love discoveries like this; unknown animal remains by a roadside or washed up to sea... Whether it is a known creature or not at the beginning of the discovery is irrelevant. What I like is the fact that everyone is curious and works together. Its a common idea to be afraid of the unknown but in cases like this something unknown is such a rare and exciting thing in today's world. be cool if it was unknown new animal but I doubt it. Thanks for your support and I agree that it is the curiousity and sense of wonder that makes these pieces so interetsing. Speaking for myself,i find the creature quite revolting, but they say that beauty is in the eye of the beholder! It is possible. they are finding new species every day. It sure is creepy though, isn't it? Dude, look at the teeth in the picture and look at the Dolphin teeth, they are nothing alike. This creature has teeth that are huge! Did you notice the date of the original article? Sep 5 2006. Two years ago. Don't you think by now they'd know what it is? Anyone know of a follow-up story? I will keep checking for a follow up on this piece, but so far there has been nothing printed about it, at least as far as I know. it is not a dolphin or any kind or a fish; that i do know. I guess it could be an Orca whale, but my understanding is that they were sure it was not anything fromt the fish world. I realize whales are in another class, but who knows? That the skin might be blubber is a most interesting point. My first thought was that it was a gray seal carcass.They can be about 8 feet long and up to 1000 pounds. The jaws look about right. The object in the picture may be larger, but it is hard to tell. Thank you for your imput. I guess it could be a gray seal. I only wonder why there have been no accounts published (at least that i know of) concerning what this creature is. don't know if it's a safe site to visit but there is a site that goes on the line that it's a beluga whale. If using google and "sakhalin shoreline"
Thanks for your thoughts on this. I don't believe we will ever really know what this creature is. If we did, it wouldn't be quite so interesting, would it? Not at all surprising if this would be a living fossil - a dinosaur-kind sea creature from prehistoric times. This thing was on englishrussia.com two years ago and was identified then. It's not prehistoric creature, the concensus on the site, was that it was either an decomposed orca, or beluga whale. Really inventorspot, if you have to resort to tripe like this to generate hits, it's a sad day. What perplexes me most is the last few comments in the article that we don't know where we come from or why we procreate... has the author not been exposed to Evolution or the thoughts of progression? Not a dig, a mere observation. Either way, this picture was on the site a few years ago, and was identified as either a bear or a whale, cant remember which. Bottom line - move along...nothing to see here. Just old internet stuff resurfacing with those that didn't see it the first time. What I want to know is, why didnt they remove the junk so we can get a better look to see what it is. It is too covered with junk to determine. I don't know the answer, but thanks for your comment.